Healthcare bill – pay or go to jail! The latest polls show that 65% of Americans are in favor of the public option in the healthcare bill. The public option would give individuals the chance to choose Medicare-style health insurance provided by the U.S. Government, over private insurance. 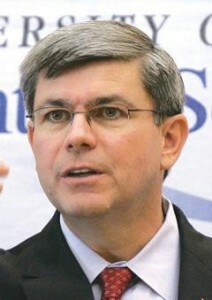 The Senate Finance Committee on Tuesday, Sept. 29, 2009, rejected efforts by liberal Democrats to for a public option. The panel headed by Chairman Max Baucus, D-Mont. rejected two “public option” proposals – by Senators Jay Rockefeller of West Virginia and Chuck Schumer of New York. This is a major victory for the healthcare industry, and for Baucus, their $4 million dollar man, who decided from the start not to include a public option. When he was running to get elected, Baucus was for the public option. He knew what the American people wanted. Now, he is doing what the healthcare industry wants. In addition to no public option, the Baucus bill gives $50 billion to the healthcare industry every year. Countries which do have a public option have lower health-care costs than the U.S. They also have a longer life expectancy and a lower infant mortality rate. The quality of U.S. healthcare is inferior to both the U.K. and Canada, both of which have free public healthcare. The Baucus bill forces 45 million uninsured Americans to sign up with the insurers, or pay a $1,900 penalty. Those who do not pay the $1,900 can be charged with a misdemeanor and face up to a year in jail or a $25,000 penalty. Baucus’ promotion of his version of the health bill makes him the greatest crook health insurance salesman of all time. He has collected more than $4 million from the insurance industry, health professionals, pharmaceuticals, health products, hospitals, nursing homes, and health services/HMOs. He wants to herd 45 million Americans into the clutches of the insurance companies. In the House of Representatives, the leader of the “Blue Dog” Democrats, who oppose health care, is Rep. Mike Ross. Ross recently sold his $300,000 pharmacy for $1.6 million to the USA Drug chain. 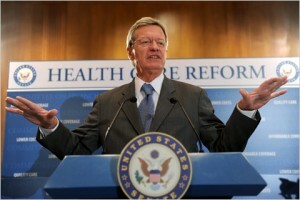 As a final touch, Baucus claims it’s too difficult to put the health care bill online as the job would take two weeks. Really? Baucus, himself admitted that “This probably sounds a little crazy to some people that we are voting on something before we have seen legislative language.” Indeed – it sounds criminal. Congress is being asked to pass the bill sight unseen. Baucus, Ross, and their fellow travelers represent the healthcare industry – and not the American people. They should have never been elected, and should be impeached and prosecuted as the common criminals they are.